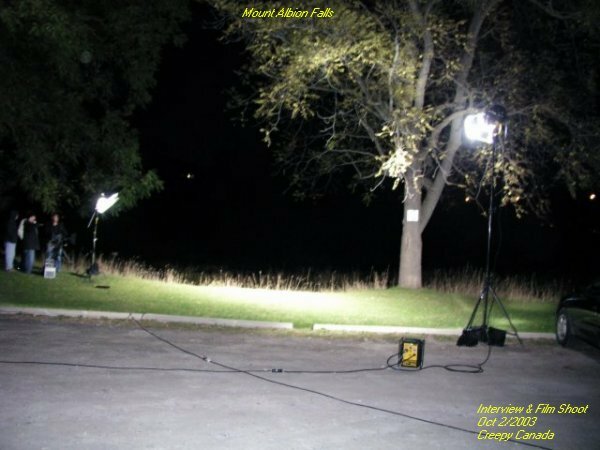 We had received an email from Brian (a producer) of Creepy Canada a few weeks ago asking if we would be interested in doing an interview with them. 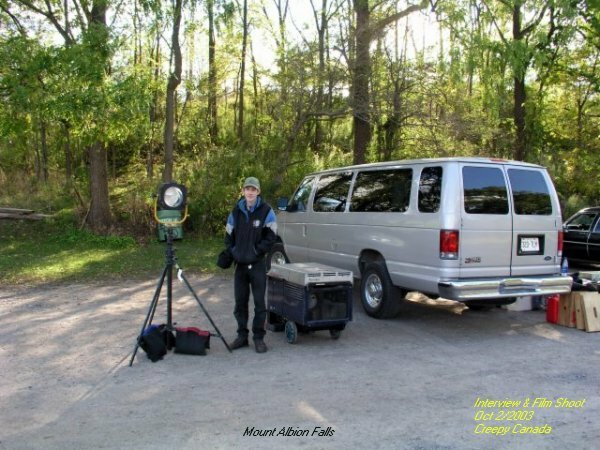 One on the topic of The Magnetic Hill in Burlington, and one on the legend of Lovers Leap at Mount Albion Falls. Then we received a phone call from Brian and we said yes, that we would be honored to do the interviews with Creepy Canada. 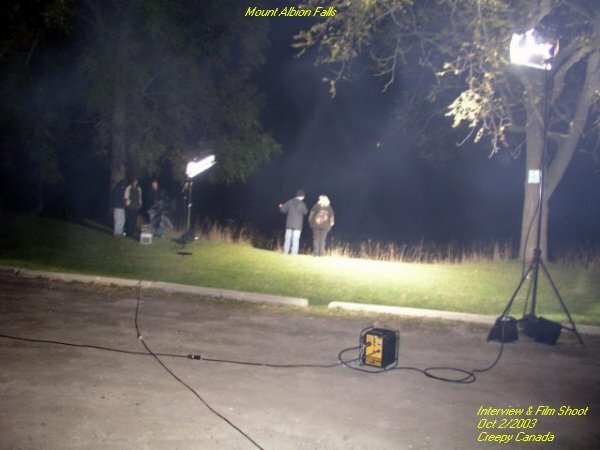 The dates were set for filming and the interviews were set for Oct 1/2003 and Oct 2/2003. It was a pleasure to have met Steve (Another Producer) and Larry (The Director) of Creepy Canada. (It airs on the Discovery Channel, The Travel Channel and The Outdoor Network.) When we asked Larry how he had discovered our site his answer was "...surfing the net for paranormal web sites." Creepy Canada did some re-enactments with some actors at Mount Albion Falls on Oct 2/2003. It was quite interesting to see how things are done behind the scenes. 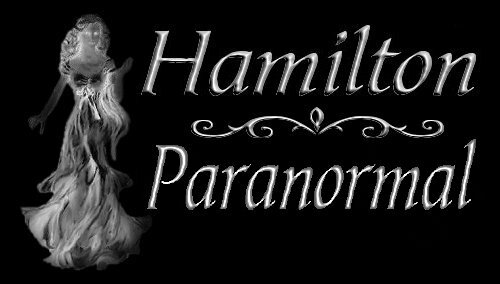 Hamilton Paranormal started out as a hobby and as time went by we gained a lot of friends with an interest into the paranormal. Below are some photos that I had taken while we were out on the set with Creepy Canada. We hope you enjoy them as much as we enjoyed taking the pictures. 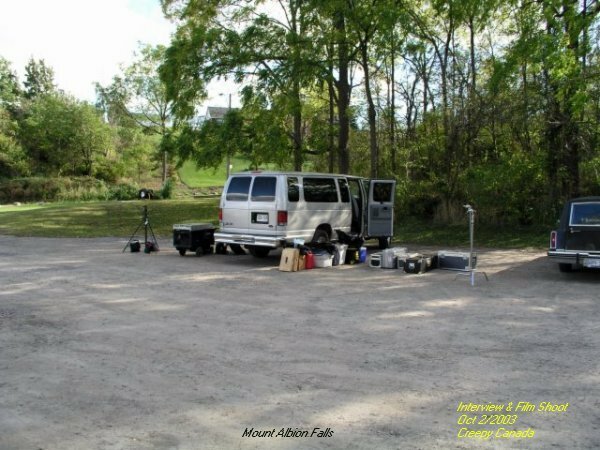 The above photo is the camera equipment and the Creepy Canada van. 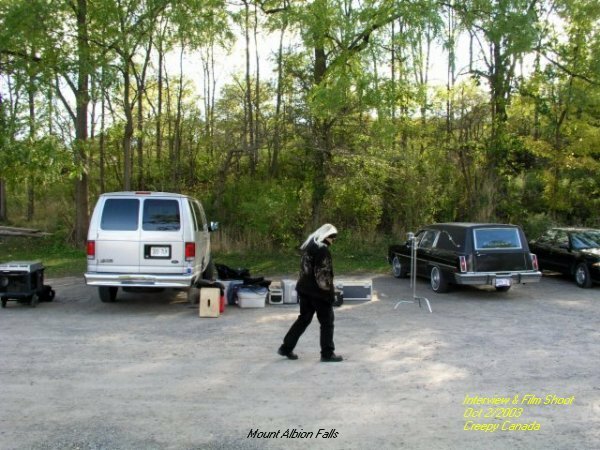 When we turned into the parking lot with the hearse the film crew did not know what to think at first. 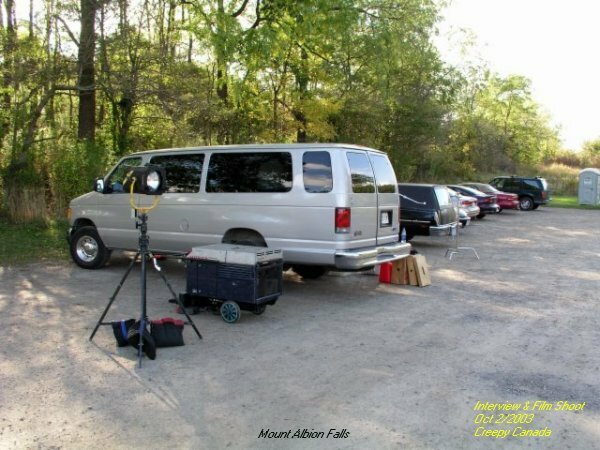 In this photo you can see a generator by the van to supply power for some of the equipment. Matthew trying to keep warm, thinking what it would be like to be a cameraman. Also he was telling me I was nuts for taking this picture. In the above photo you see Cathy pacing up and down the parking lot trying to keep warm. It was very cold this day and the wind did not help a whole lot. In this shot I was surprised to capture some ecto mist on the set. I had shown this picture to Larry (The Director) telling him I think maybe Jane Rielly may have been on the set tonight. Larry was filling in Cathy about what he wanted her to do in a short clip. After I had taken this picture I took the following one and you will see that the ecto mist had vanished. In this photo taken moments after the previous photo you can see it was indeed a clear night. So did Jane Rielly drop by the set to make sure we were portraying her in the right light? There are many tales to this area and we are sure there will be more tales told by those that may experience something to this location over time. We Thank Creepy Canada for taking an interest in our web site (Hamilton Paranormal) and we hope that folks will visit the two locations we have done with the film crew. Keep checking back for the actual air time when Hamilton Paranormal will be televised.